The Summer 2010 issue of Delight gluten free Magazine includes a delicious sounding recipe for Shrimp & Chicken Pad Thai using maple syrup. Soak the noodles in warm water for 15-20 minutes or until flexible. Drain. In a separate bowl, mix the fish sauce ,maple syrup, and lime juice and set aside. Heat a wok again and drizzle oil around edges. Add egg and cook until set. Remove from wok and cutting board and julienne. Heat wok again and add more oil. Add curry paste and stir fry for a few seconds. Add shrimp and stir fry until pink and cooked through. Remove shrimp to bowl. Wipe wok, add new oil, heat, and stir fry chicken until fully cooked. Add chicken to shrimp bowl. Heat wok again and add more oil. Stir-fry cabbage and carrots until tender. Add drained noodles and toss and cook until al dente, about 3 minutes. Add some of the fish sauce/lime juice mixture to wok. If the mixture seems too dry, add in chicken stock. The mixture should be a little soupy, but noodles will absorb the liquid as they cook. Add shrimp and chicken back to the wok with remaining fish sauce mixture and fold in well. Add egg, bean sprouts, and scallions and toss gently. Cook until sauce is absorbed and everything is hot. Taste and adjust seasonings. 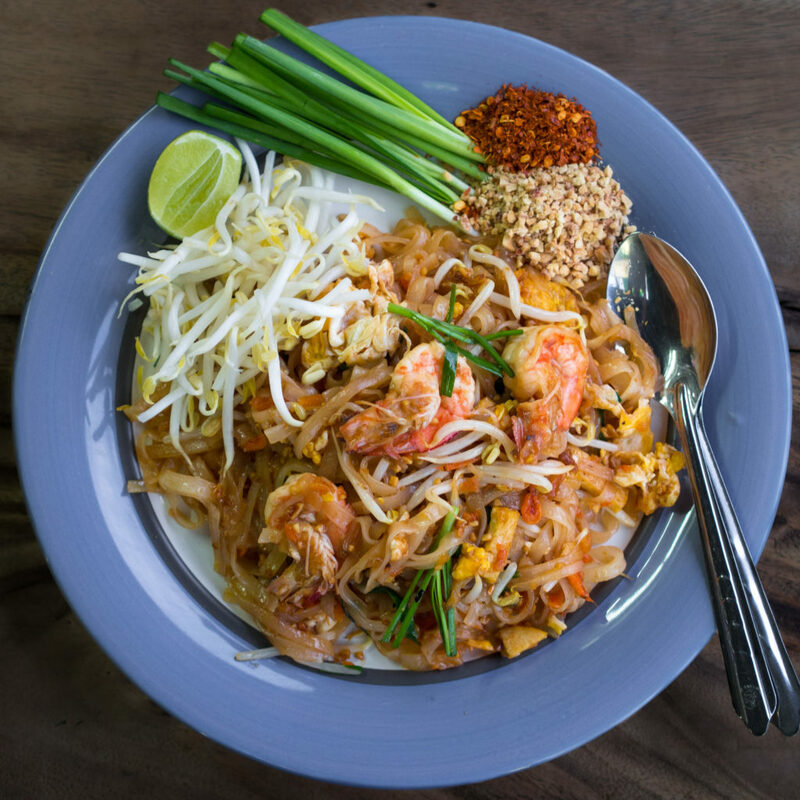 Turn out Pad Thai on large platter and sprinkle with peanuts and cilantro.